On my second day, I got a cabinet which helps me with storage. I payed my down payment and now am trying to get my villagers to like me to get the permit. I now officially hate Astrid for making me trade an Emerald for a lousy Tee. Now I'm just worried on how to get the upgraded equipment, like the golden shovel. I want to figure out on my own- but I really have no idea where to begin the process. Not as simple as burying one and waiting a day. After my meltdown, Gurren and Onett have been brought into existence. I've paid off my first house loan, and am working on getting that permit. After that I'll continue as I was. I think I found the really annoying thing in this game: beetle farming is the only practical and reliable way (unless you play the stalk market with others) to make enough bells to afford all the house upgrades and public works projects, which really takes away from the fun of it and turns it into a tedious chore. Looks like I'm going to be tearing up my island soon to optimize it for farming. As June is almost over, I'm also going to post this. These critters disappear in July, so be sure to snag them in the next four days. Only missing two of them. Need an axe to get one though and Nookling refuse to sell one. Anyway, I got my 100 per cent approval rating and now my Development Permit is waiting to be accepted. The garden sells the axe, and you won't get that for a few days. Mine just opened earlier. Last edited by Cat333Pokémon; June 27, 2013 at 12:43:29 AM. Oh right. Do you think I'll be able to get it before the end of the month? If not, could I pop to your Garden and get one? I've found everything except for the Char- which I don't know how to catch. When they say "underneath the waterfall" do they mean the area around the waterfall or actually inside the waterfall? Yeah, my garden has one. I can give it to you. It's actually the top of the waterfall, not the bottom. Holy fish sticks! I caught a coelacanth! At least they acknowledge that first syllable is hard to pronounce. There's something unsettling about that shirt. Hehe, it's pretty cute to see these two beetles duke it out in the museum. I don't believe homework is a "fine" item. Gulliver landed in my town! *breathes in and out slowly* I HATE YOU FOR PLOPPING YOUR STUPID HOUSE IN THE MIDDLE OF MY FRUIT ORCHARD, DESTROYING MY TREES IN THE PROCESS. Seriously, this is the absolute worst feature in this game! The random placement of houses makes it practically impossible to design an entire town around a pixel-perfect theme without somebody fudging it up! I found this image online. That should sum it how terrible it can be. They really should have retained the sign posts from before so you know where the houses will be. Hey, I'm the mayor. I should be allowed to evict them or decide where their homes go. We need to run the Homeowner's Association instead of letting them push our "perfect towns" around! I broke my ax the first day I got it. My house now has a 6X6 upper floor, and I can now start expanding to other rooms (this doesn't smell cheap at all). Got a nice silver net from the museum, which continues growing nicely (got some dinosaurs completed, including the T-rex). Also Club LOL finally opened today. If you go there after 8 PM, KK is there playing party rave mixes of his songs. If you go on Saturday it'll be like previous games where you can request a song and then get a copy for your music player. Me in front of my current dwelling. Woah, this game is based on true events!? Aww, it's so fuzzy and cuddly. Me shaking my groove thing to DJ KK. You actually caught one?! Nice! I saw a tarantula running around yesterday when I was talking to someone in game, of course it disappeared without me even trying to catch it. Hmm, this is the first Animal Crossing game where I caught a bee and a attacking ground bug. Not sure if because I have better gaming skills, or it's just easier in New Leaf. Also I saw a tarantula while on the title screen once. Last edited by Yoshi648; June 28, 2013 at 09:29:32 AM. I managed to catch 3 dorado's! I had absolutely no idea they were rare, so I donated one and planned to sell 3. It was only when they payed me 30,000 Bells that I knew something was special. I also caught 2 tarantula's and I'm keeping one as a pet because I can. As my first public works project, I began collecting funds for a street lamp and no one decided to donate so I payed half of it off myself. And then, like Cat, became extremely annoyed that someone decided to plonk their house in the middle of my planned cafe location. Last edited by RotomGuy; June 28, 2013 at 08:09:31 AM. Well, something interesting happened this morning. I was walking around town and I saw this out of the corner of my eye. 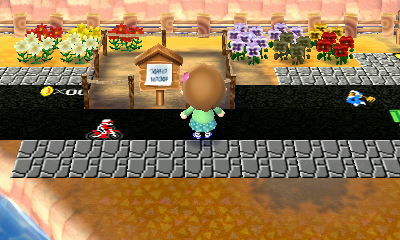 Sure enough, when I visited the Town Hall, Isabelle notified me that my town did actually achieve perfect status. If it's just like the last AC game, I can get a Gold Watering can if I can maintain a perfect town for 10 days. I also visited Katrina today...and she said that disaster was heading toward my health. >_< Luckily though, the lucky item she explained was a T-shirt, which I was already wearing. So now I'm not going to be falling all over the place. I guess I could say goodbye to my life now. I'm going into AC:NL. I think I'll think about the mayor and town name while I'm taking a shower, which will be right now. I finally got a Sling Shot today! Welcome to the addicted constantly playing mildly attracted to New Leaf side! Anyway, no one except one person in my town decided to donate to this lamp so I payed it all off myself. And I decided to start breeding flowers early, unlike my other AC games. I got a Blue Pansy! Although it isn't much, it's something as I couldn't breed anything in older games. I also found a new flower, a White Lily. Last edited by RotomGuy; June 29, 2013 at 07:29:11 AM. Now that I have the game, I have to ask this - do you think it might be a good idea for me to ask for 3DS friend code exchanges right here, right now? You should probably spend the first couple days getting acquainted with the game. It takes time for things to unlock, and there are still lots of activities to do on your own. If you visit someone's town, you'll likely spoil many of the things you'll get before getting them (which have been talked about at length in this thread, such as beetle farming). Am I a pretty princess? You are in the wrong game man. Meh, give him a few minutes and it'll feel like an attack. Me trying to catch the elusive 333 Catfish. Can't wait to stuff it and hang it in the museum. Cat sure is setting the dance floor on fire. Cat and I picking out snacks for our next adventure. ...I just realized that putting me and Cat side by side is going to be so confusing. It seems like we have the exact same appearance! I chose my eyes because those were the ones I've had in every game since the GameCube one. Ah, it seems like I'm a bit mistaken. Just the clothes. Today I visited Reuniclus to get a Pikmin Hat, picked up some new fruit. Twiggy visited me and is currently roaming my town right now. I managed to pay my loan off and begin expansion constructions just before Nook closed, and visited the new person who tore up my building plans with their poorly located house. It turned out to be Coco, a bunny with a coconut for a head. Not sure if its a mask or hat, but it's weird. I just thought of something cool. It would have been interesting if the CD shelf would have showed the size of your K.K. song collection, so you could show off what you've gotten so far. GAH, someone parked their house right nextdoor to mine. It's getting worse! It didn't destroy anything of real value, but its still too close for comfort. OHMYGOSH KK SLIDER! Yes I wanna go to space. The artwork for K.K. Disco. It's funky man! Yeah, KK songs now have artwork so you can either put it in your music player, or hang the art on your wall. Also KK now plays multiple songs per night, but you only get the CD for the first song. Also my new Pokemon Trainer outfit I found online (very appropriate for bug/fish hunting. Gotta catch 'em all right?). You had ONE job, and you fall asleep during it. Uh, Chester IS a bear. Because of that, this pun can go in multiple directions now. Ohhhhh NO. It's that cat that got stuck in my Wild World town and kept following me around! At least now I have the choice to leave her be. I traveled to Cat's town to sell 9 stacks of Perfect Oranges, but I didn't expect to get this many bells for the stacks. I CAUGHT MY FIRST COELACANTH! What's more is that I walked around 6 steps to the right and I caught another one! I think Isabelle has a crush on me. Being the only human in town will do that to you. This bear seems to have a problem... a cuteness problem? No, get up and get ready for school. Me and Twiggy having a mature, organised debate. Completion of my first Public Works Project: donated entirely by me. You do know that Mac is a dog villager, who lives in this town at this very moment? Last edited by Cat333Pokémon; June 30, 2013 at 10:19:58 AM. Well, I bought 4,000 turnips today. Here's hoping I can sell them and tell the beetles they're safe for a week. Last edited by Cat333Pokémon; July 10, 2013 at 07:50:06 PM. has anyone round here noticed grass wear at all? i've heard that it's back from City Folk, and with City Folk i got too frustrated with it to play any more. the scoop is that it's not as bad, but regardless i don't want Svalbard to be mayor of a desert. Is there any way to grow that grass back? It wears, but you can put patterns on the ground to preserve it. Stop spreading lies. It's been shown that putting patterns on the ground does not work. Second fish I caught, and it was a coelacanth. Yep, that's about right. The last time I remember playing was right before Wild World came out, but it appears I played it last about 4½ years ago. I think I had tried time traveling to 2003 just for different seasons, though. I used a lot of the codes to get Nintendo items, and the housing center and my basement were covered with random items and raffle tickets. I don't think the catalog existed at the time, the house could only have three rooms, and storage items could only hold three items each. Also, Nook's was closed (due to the raffle, and I had no June tickets) so I couldn't sell all the junk lying around in my basement. The post office was almost completely full, and there were lots of presents. I'm betting some of those were fossils, as you had to mail them to the Faraway Museum. My music collection was about a third of the songs. My second house had quite a few town models and musical instruments. At least I was able to check out the island too. This was the first clover I pulled. Wow. On the other hand, this game had barely been played. I think it's because City Folk is more of a port of Wild World than a completely new entry in the series. (Yoshi played it a lot, but he skipped Wild World.) I didn't have many fish or bugs in the museum, the house only had a single floor, and I didn't own a single K.K. Slider song. I don't believe I ever time traveled in this one, either. I'll be back to posting New Leaf screenshots after this. I think I may actually resume the original a little bit, if only to clean up the junk around my house. It's been eight years since I started it, and maybe I can play it a little bit once I run out of stuff to do in New Leaf. Last edited by Cat333Pokémon; June 30, 2013 at 07:35:46 PM. Aw cripes, it doesn't? Well, time to stop with that project. So then Mr. Smarty, what CAN I do? It appears there is a cap on the amount of your town can be dirt this time around. If you hit that cap and continue to pass through an area, it will simply regrow somewhere else. Oh, Cat, you sneaky guy. You've been playing this game without me, so now it's my turn. I moved in to Cat's town and stole the place right next to the bulletin board, then I took some of the foreign fruit (mmm, peaches) from the trees and sold them at Re-Tail to pay off my debt. No more tent for me in the morning! Pity I don't get to steal his encyclopedia too. Oh, and the VERY first fish I caught? A freshwater goby, which wasn't in the museum. Last edited by Zoroark; July 1, 2013 at 12:24:49 AM. I take this back. The catalog did exist, which raises the question: why the heck did I save so many pointless items?! Really Cat making up conversations with yourself? It's weird it's been rainy in my town for more then a week which matches the exact weather I've been having. Anyone set up a Camp Site because you get foreign visitors with it. Last edited by Magmaster12; July 1, 2013 at 02:25:46 PM. Yeah, I set one up and got a visitor, but they weren't interested in staying. I just got the game and moved into the town of "Venturas" named after Las Venturas out of the game Grand Theft Auto: San Andreas. I named my character Jake, which some of you know is my IRL name. My native fruit appears to be peach which is rather interesting. Last edited by PureAurorae; July 2, 2013 at 05:36:41 AM. Please promise you will bury your perfect fruit the second you see it. 3DS FC System: Now linked to the system instead of the games. Holy heck, I thought it was just me about the Cicada's. At first I recognised the sounds as atmosphere sounds in the Pikmin games but then I decided I didn't like atmosphere sounds anymore. Also, in a fit of stupidity I sold the Perfect Cherry in my town. Does one appear again or am I Perfect Cherryless forever? Last edited by RotomGuy; July 2, 2013 at 10:04:58 AM. Worry not, as the one perfect fruit in your town will re-appear at some point. I made the same mistake with my perfect pear, but now I have perfect pear trees all over town. In other news I have been playing since release but have still yet to play online. Anybody want me to pay their town a visit? I come bearing exotic fruit and bells which can go towards public works projects! My turnip prices are currently 221 bells per turnip. It was the most savage battle ever, but I came out victorious. But I want to change into no clothes! Don't give me a hand (er paw) or anything Isabell, you just stand there looking cute while I dig myself out of this hole. We all love you Mr. Resetti. Yep, no one would ever do that to your high-class jokes. Katie appeared in my town. Took her over to Unova (Cat's town) so I should get a special item in the mail tomorrow. Finally got the Cafe, where you can find KK Slider hanging out during the day. Also Shampoodle opened up yesterday and I ran into Phineas today who gave me 4 new Achievements medals. Also this month is going to be fun with non-stop buzzing from cicadas. Last edited by Yoshi648; July 3, 2013 at 05:34:13 AM. Rotomguy visited my town 2 days ago and we ended up going on a few tours together. I got my first Silver Slingshot! I ended up seeing two more flying around in the air after finding this one, but I could only shoot 1 of those down. Also caught my first tarantula in New Leaf! (and maybe first time in any AC game). Tarantulas have a tendency to run into rivers or disappear randomly in this game. Please don't be disheartened by this, but I've recently found out about a few game-breaking bugs existing in this game. I already mentioned the non-bug where attempting to be sneaky with SD cards will completely wipe your save data, but there are a few other issues that apply to both the digital and physical versions. Accidentally touching the "Backup" button (recent 3DS update) while New Leaf is selected will wipe your save data. It's possible for a situation to arise where holding anything in your inventory or locker can cause the game to freeze while saving, losing recent progress and rendering the locker useless. Some cartridges are defective and can lose their ability to save. If you fail to save at certain points, features of the game may be disabled. A common example I've seen involves not saving after getting the signatures for Dr. Shrunk causes the doc to disappear and Club LOL to not open. Another is after talking to Tortimer to grant island access. The only solution to this problem involves tricky time traveling. The game occasionally freezes when returning from the home menu, losing recent progress. The game occasionally freezes when entering other towns. It's possible to clip into the rivers (I'm going to post pics of this once I can do it myself. ), off cliffs, and onto the "secret beach" (beach without a ramp in some towns) and get stuck, requiring save/quit to respawn at home. Ground, character faces, and other textures sometimes fail to render, usually with the game freezing soon after. Saving may take far longer than usual (several minutes) sometimes. Attempting to use multiple SD cards to create a backup or multiple towns will erase the original save file. Using old or faulty SD cards can erase save data when attempting to save. Last edited by Cat333Pokémon; July 3, 2013 at 01:14:44 AM. Patch incoming? The game does support patching, so it's nit as bad as what you'd get before. My gate is currently open so if anyone would like to visit, you are more than welcome! The island mini-games are quite fun. With other people, they are WAY better. Reminds me a lot of Mario Party. I declare that groups of four need to be organized so that these games can be enjoyed to their fullest. Last edited by Alakazamaster; July 3, 2013 at 07:07:06 AM. I wanna be in a gwoup! Yay~! When I woke up this morning I went to my huge flower meadow near the center of my town and I saw... the most interesting thing. A BLACK rose. I don't even know how it got there. But it's BLACK. It is now my favorite flower and I will cherish it for life. Picture time, and there are a lot of 'em! Oh hey, villagers do water flowers even without the Beautiful Town ordinance. Ouch! That scorpion wasn't cuddly. Ooh, a fan of REO Speedwagon? And I was half expecting a sword. Oh wait. Yep, turnips are definitely the best way to make money in this game. Hey, Katrina. What's my fortune today? Last edited by Cat333Pokémon; July 3, 2013 at 03:45:12 PM. *steals Cat's SD card* My turn! I don't see what was so hard about catching a mantis. Aww, I can't join Cat at the island yet. Wait, isn't Kapp'n already making stops, just not when I'm around? That's not how a turf war works! Last edited by Zoroark; July 3, 2013 at 03:09:26 PM. Last edited by Magmaster12; July 4, 2013 at 06:20:54 AM. Has anyone got an axe in their town that I could *possibly* purchase? All Leif ever sells in my town are watering cans. I have 1 practically untouched axe, and one that's half broken. It's annoying when Leif only sells watering cans- I can't stock up on axes. Because storing letters into boxes (while I do all the organizational work) is very tough. You made a team, be proud of that! Yet items are practically weightless when they are shoved in your pockets. Money rock gave ores today, SO MUCH SHINY. Yeah, there is a crazy guy named Cat running around. Seems very suspicious, should be thrown into the room full of Pitfall seeds. This proof you don't even need to go to the island to make a lot of money. I haven't gone in a week and I've made 100,000 on my own. Bought Club Tortimer membership today, aparently it allows you to play island minigames with random people over Wifi. Do you know what else is awful? SELLING THE MAYOR FORGED ART. What were you expecting? A sea bass? For a shark? Thank you sweetie. Hooray for noisy, alternative energy! Rotomguy, PureAurorae, and I head to the island. ...but very lousy fossil diggers. Last edited by Cat333Pokémon; July 5, 2013 at 12:43:29 PM. The fossil one is always difficult with more people. Filling out more than one house while worrying about the position of the fossils just makes things more complicated. The Labyrinth is usually easier with more people. Everyone collects the fruit (whether or not they need it) and drops it at the beginning of the level for others to pick up. Pure and I did this trick and it worked very well. Last edited by Cat333Pokémon; July 5, 2013 at 12:43:46 PM. I got an Insect Maniac Badge today. I have to admit I'm really disappointed with the sling shot, all you can use for is to get terrible balloon themed items. Hey, I got that badge today too. I haven't got the slingshot yet I have about half the balloon series thanks to the net and cliff trick. It only works if the balloon is going in the direction of the cliff but its stiff very useful. Personally, the Balloon TV is the only good looking one in the series. Cat and I have some new screenshots, but these few are the most important. I am Jesus, and I can walk on the river and dive without a wetsuit. Upgraded to the T&T mart, the second fortune cookie got me the item I've wanted forever: the S.S. Dolphin! My flowers are breeding well too, and all seems well with the village. I was silly though, and started a super expensive project. The villagers are so slow donating it'll never get done. That complement is so great, it's almost an insult! Reun and I tie for *iforgotwhatitwascatchingfishorbugsorsomething*. CAT IS A LOSER! Sweet my favorite show, infinite loop of rolling apples. Cat and I attempting to make a small pond. Didn't work very well. That is the best dream I've ever heard. Yes your house is very cluttered. I always fall asleep while standing up. Hey, does anybody around here have any of the following musical instruments? I'm trying to complete my collection. I could offer you the Bagpipes, though I would need a suitable Gulliver item in return. I can give you the metal guitar. I only have it because it fills the void of not having a Georgey Sitar. The double neck you can download from Best Buy, or something. Is that so hard? Best Buy doesn't have the double neck guitar yet. I think it's been released in Japan, though. I'll gladly take the guitar off your hands, though. Would you like to catalog anything of mine? I own the rest of the instruments. I think you can re-order the bagpipes from the catalog. (Might want to check, though.) If not, I have the helm. Last edited by Cat333Pokémon; July 7, 2013 at 03:24:12 PM. I'm so sorry you're that impatient If I could do that catalog thing with the Sitar that'd be great. If I have to say SOMETHING nice, thanks for telling me that trick about the catalog. I thought it had absolutely no use to me until now. The café also opened up in my town after funding a public works project. I love drinking coffee~ but it looks like Brewster doesn't have a gyroid storage anymore just like he had in City Folk. We make a great gardening team. This is probably my favorite fish in the game. Cat told me earlier about this kind of fish- apparently they're rare. Shampoodle is now open in my town! This is what I currently look like in front of my house. It definitely feels more like home. Okay all 5 objects I've received from the fortune cookie I've now received twice I should probably stop taking them. I have 5 Hero's Boots and 2 Hero's Caps from fortune cookies. I just need the Red Pikmin Hat, the Blue Pikmin Hat and the Pikmin Garden and I'll never buy one again. I'm also looking for the regular lucky cat. I have the other three. Yeah, let me know if the bagpipes can be re-ordered from the catalog. Last edited by Cat333Pokémon; July 8, 2013 at 01:50:40 AM. Going to start collecting Modern furniture, haven't got any pieces yet but I will be willing to come to a price/ item swap. They can, and I did. Along with Modern Items, I am also buying silver nuggets to customise my Modern furniture. I'll trade you a red Pikmin hat for a set of boots. So I got some island exclusive bugs today but again my useless fishing skills didn't get me any fish. Also, I collected all the signatures for Club LOL. Building is commencing. I don't think I'll be going for HHA points until later. All that strict and specific organizations sounds too difficult for me. I think I should just get situated first. Today was great for openings. Club LOL has FINALLY opened even though I can't go in until 8 for KK. (Doesn't stop me from celebrating by learning K.K. Rock on the piano.) Kicks also opened so now I can get rid of these basic things (No, I shall keep them FOREVER!) And now... I've FINALLY finished funding my first public works project! Oh man, I feel so great~! But it was so expensive that it took like weeks, I won't be doing that again too soon. Jeez, I sure take a lot of junk pictures (tapping both buttons by accident while running, funny phrases that aren't funny enough to share, and other stupid stuff). Time to sort 'em! If you're going to plant a pitfall seed, try not to step on it. That's the right kind of gift, right? One you just saw me pluck off your neighbor? She's on a magical adventure! I got a digital photo frame for taking her to another town. Is that a sequel to The Butterfly Effect? I'm not sure what the other one is a reference to, though. Sweet! I even managed to swipe a silver shovel from there. That cover looks strikingly like the cast to Star Fox. My luck is terrible with these scorpions. Yay, now I can decorate it with a whole ensemble. Can you beat my time on the Elite Scavenger Hunt? About time I can start getting emotions. Also, with musical instruments, I just need a timpano drum, amp, and ukulele (then the double-neck guitar at the end of the month). Last edited by Cat333Pokémon; July 9, 2013 at 03:06:23 PM. I have an ampy thingy, but it's mine and I can't let you have it. But you can do that catalog thing that you did before. I'm saving it for if I find a bass. Can't imagine why anyone would want to sign that IN THE MIDDLE OF SUMMER. so liek, I'm shaking trees to find stuff and this lovely Throne lands on the ground. Got enough to pay off a house expansion. I visited Greenman's town where I ran into Pate (who also lives in my town). See? Even Shrunk thinks his jokes are boring. Working at the cafe filling out very vague orders of what people want. Oh I'm a GENIUS! Walkin on water. Also the folder on my computer where I store all my AC NL photos has 348 pictures in it. Last edited by Yoshi648; July 10, 2013 at 06:58:35 PM.